Then ... Lester desperately scours the downtown streets for the fleeing Myra. When he spots her he chases her through a maze of dark streets, back alleys and narrow stairways, all filmed not in San Francisco but in the Bunker Hill neighborhood of Los Angeles. During the chase Jack Palance, always a fitness nut, demonstrates his athleticism with several vaults, as below, over fences and railings. ... from the 1950s ... the building on the left, above, is the Boswell (aka Bozwell) Apartments at 245 S. Flower Street, below. In this vintage photo the alley steps and the handrail Lester vaulted over are along the left side of the building (that same lamppost on the pavement helps confirm the location). The apartments are next to the St. Regis Apartments, partially visible on the right. Modestly narrow in width, the Boswell stretched way back, motel style, half a block in length. ... and Now, the Boswell is long gone, but it would have been alongside this high-rise apartment tower, part of the Bunker Hill Towers complex, viewed from S. Flower Street near W. 3rd. Then ... She gives him the slip and he continues to prowl the streets in his car. 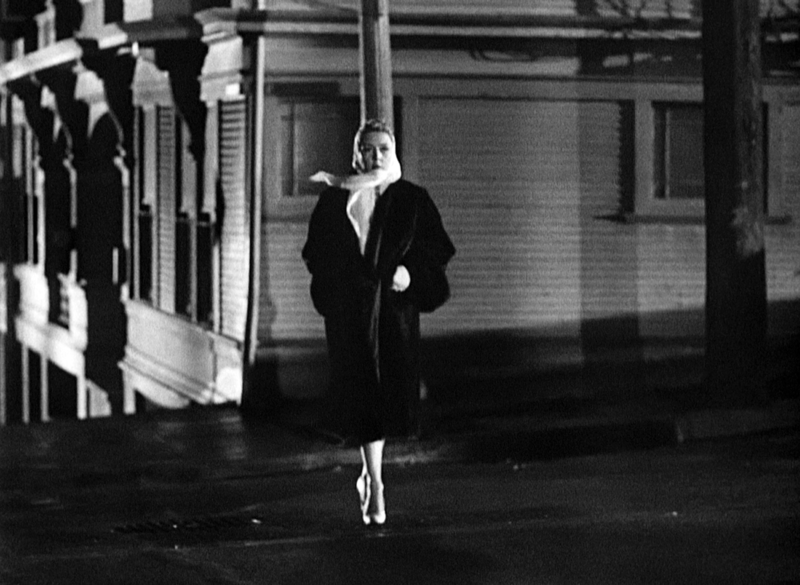 Meanwhile Irene is walking home, wearing a dark coat and white scarf, just like Myra. Here, she crests a steep block and crosses the street. ... from 1948 ... This vintage photo reveals where this corner was ... the Claridge Hotel at 428 W. 2nd in Bunker Hill. Then ... Lester rounds a corner in a shot highlighted by the noir-lit building at the top of the street. ... and Now, this view looks west up 2nd Street to Grand Avenue. The lighted building above is the Dome Hotel Apartments. Today the same location is unrecognizable thanks (or no thanks depending on your point of view) to the redevelopment in the 1950s and 60s during which Bunker Hill was literally scraped away then built over. The corner spot where the Dome stood is now a part of a large open parking lot. ... from the glory days ... but we can at least enjoy photographs from the past - here's a closeup of the onion-topped Dome Hotel Apartments in its prime. Apartments started at $50 per month… furnished! Then ... Lester mistakes Irene for Myra and angrily aims his car at her as she turns back and runs down 2nd towards Olive past a rather distinctive building. ... from 1948 ... here's the same building in this capture from a wonderful 1940s Bunker Hill video. It's the Mission Apartments at 504 W. 2nd Street at Olive. The corner building across Olive is the Claridge Hotel seen earlier in this post behind Irene as she crossed Olive. This informative image also captures the Hotel Astor on the corner of Hill Street and the balustrade above the 2nd Street tunnel. ... and Now, again, unrecognizable. Those wonderfully evocative old places now seem like figments of the imagination. On a trivia note, Patricia Knight and Cornel Wilde were filmed in the 1949 movie Shockproof at this same location. And it was used again in Stanley Kubrick's 1956 movie The Killing when Sterling Hayden drives to the Mission Apartments for a meeting. Then ... Getting back to this movie ... at the last second Lester, his rage turning in an instant to horror, recognizes Irene and hits the brake. In a twist that punishes the schemers and spares the intended victim he plows into her and they are both killed, pinned by the up-ended car where it comes to rest in front of the side of the Claridge Hotel across Olive. In 1950s Hollywood movies, crime doesn't pay. ... from 1948 ... this vintage image gives us a daylight view of the same spot. ... and Now, this location has become a parking lot. Thankfully Los Angeles' art deco City Hall in the left background was left untouched by the wrecking ball. As a bonus, here's a look at the fatal denouement from the reverse angle - the arrows overlaid on this 1940s photo show the path of Lester's car from the Dome Hotel Apartments on Grand Avenue, down 2nd Street past the Mission Apartments, striking Irene on Olive and coming to a halt alongside the Claridge Hotel just off the picture at far left.